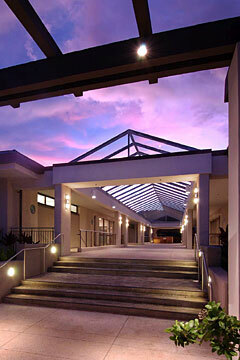 Example of architect work by John Hara: Science Learning Center at Punahou School. When architect John Hara designs a building, he uses the site's natural light, air currents and topography. From the ecology movement of the 1970s to its rebirth as today's "sustainability," Hara has been one of the first in Hawaii to consistently use natural elements in building design. Hara's intent has been to create buildings that "make sense" and "help clients accomplish their program." Hara recently became the first architect to be honored with the Governor's Award for Distinguished Achievement in Culture, Arts, and Humanities from the State Foundation on Culture and the Arts. Awarded last month, it is the state's highest honor to an individual who has made significant outstanding lifetime contributions to Hawaii. "I am absolutely thrilled by it," said Hara, who established John Hara Associates Inc. in 1970. And "surprised," as well, because architects are overlooked "all the time" by the public as well as the art world, he added. Compared with his peers, "maybe I was more rational, instead of doing something because I liked what it looks like. Too often people are more interested in window dressing," he said. For more than 35 years, Hara kept his practice "small enough to do a few projects well." Since 1974, Hara's buildings have won more than 30 Excellence in Architecture and other design awards from the American Institute of Architects and other bodies in the industry. Hara's signature is on dozens of private homes and 25 significant public, academic and cultural facilities for such clients as the Honolulu Academy of Arts, Maui Arts & Cultural Center, University of Hawaii campuses, Punahou School and the Kamehameha Schools. His firm's commitment to meeting national standards of environmentally sustainable design resulted in the Gold LEED (Leadership, Energy and Environmental Design) Certification by the U.S. Green Building Council. 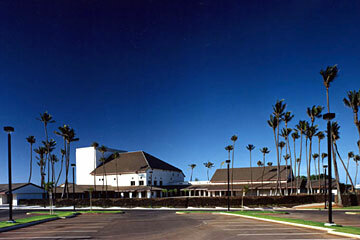 Example of architect work by John Hara: Case Middle School at Punahou. Punahou's Case Middle School, a complex of nine buildings, was the "first major project in Hawaii to use sustainability principles," which focused on the effective use of energy, he said. Hara put in windows on both sides of the classrooms so that tradewinds cooled them with cross ventilation instead of air conditioning. He put in skylights, tinted the windows to keep out the heat and glare, and installed a "visual dimming system" that automatically controlled the amount of artificial light according to how bright the sunlight was, he said. The buildings were situated to create "small learning communities" in line with the educational philosophy of the middle school, and used soundproofing materials where students congregated in large numbers, Hara said. Often associated with his name is the Maui art center, built 10 years ago, which made artwork an intrinsic part of his design in spite of the usual constraints on funding and time, he said. Among the "outstanding set of commissions" by local artists were a 500-plus-foot rock wall built by Hana masons, an arcade grille designed by Maui third-graders and an aluminum entry gate designed by fiber artist Pat Hickman. "It worked out wonderfully," he added. Hara was also "careful to (keep) the connection between mountain and sea" throughout the buildings and the center, with unfettered views of both through the corridors. He is currently in the early stages of designing the University of Hawaii's West Oahu campus in Ewa, making the tree-lined drainage ditches that traverse the site a part of the landscaping. The "natural instinct of others would be to fill them (the ditches) in," but Hara plans to keep them because "everywhere you go, we're losing a part of where we live when we tear things down," Hara said. 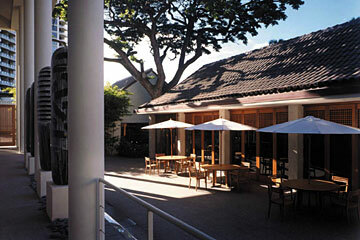 Example of architect work by John Hara: The Honolulu Academy of Arts Luce Pavilion. 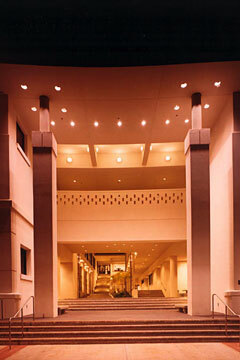 Example of architect work by John Hara: The Maui Arts & Cultural Center.